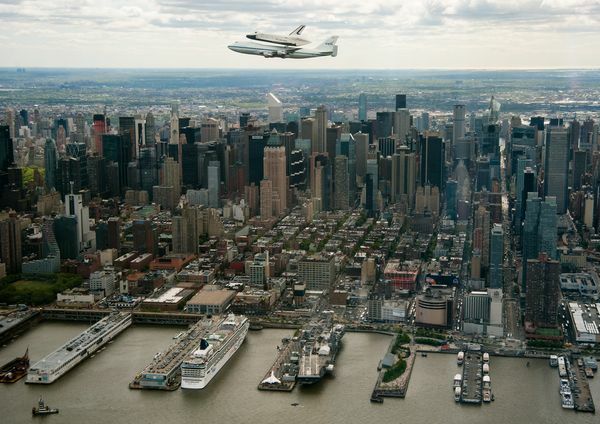 This article by Judi McLeod about the New York flyby of the Shuttle Test Article Enterprise compares the Washington overflight of Discovery and the New York overflight to a state funeral. I remember the funeral of John F. Kennedy, and that event and the shuttle flights are both events that are very much misunderstood by the American public. That may or may not be true; I doubt we will ever know in any of our lifetimes. Too many records have been sealed for too long and are not set to be released for decades yet. Still, I remember seeing the funeral on television. No matter what your political stripe, it was a sobering thing for America. The overflights of the shuttles should be thought of as a funeral procession as well, argues Ms. McLeod, and to a degree I agree with her. If we had a strong follow-on human spaceflight program going on, the retirement of the shuttles would be a celebration of American technological prowess. We have no such program. The meager amount of money NASA can dole out and the books of restrictions on private spaceflight companies stifle the development of the kinds of vehicles we can build with today’s technology. We are force to launch super-Apollo capsules on the cheap, maybe two years or more from now. Until then, we ride Russian 1960s-technology spacecraft. That should never have been allowed to occur. I blame the Clinton, Bush 43 and Obama administrations. Nobody was willing to come out in favor of bold new space exploration initiatives. For that matter, Congress has generally only been interested in NASA as a jobs program for certain Congressional districts. (Otherwise, why would NASA put its major facility in Houston, Texas? Thanks, LBJ.) Other than Dana Rohrabacher, congressman from California, I can’t think of a single congresscritter who has consistently supported the space program. So for all of you celebrating the overflights of Discovery and Enterprise – look, they are now going into museums. Once, we flew these wonderful machines into space. Now, we beg for rides with the Russians. And didn’t we say the Russians were the ones on the ropes? You are currently browsing the The Old Gray Cat blog archives for the day Sunday, April 29th, 2012.